This was such a fun project I did for my little girl's first "Big Girl Room" and one of my first real DIY projects. I love the way it turned out! And, most importantly, so does she. :) My favorite parts are the draping wisteria flowers and the yellow ribbon that cascades down a few feet. Anyway, want to make a canopy for yourself? It's very easy and there are lots of tutorials online that are quite detailed, but for crafts like this I tend to wing it. Here's my quick and dirty how-to: I cut my netting in half so that I had two pieces. Then I looped it around the wreath frame and hot-glued it in place. Then I used the hot glue gun to put the flowers around the top. Then I glued ribbon draping down the side. Then I tied 3 lengths of ribbon evenly spaced around the top and put a loop at the top of each ribbon at the same distance, then hung them on a hook screwed into the ceiling. Getting it to lay flat was the most difficult part, but once I got the loops on correctly, we were good to go! We love it and I'm sure you will too. :) It's so easy to adapt for different styles--you can go with bright pink and black with beads and feathes if you like that, or you could go even more natural with robin eggs, sticks and flowers. The possibilities are limitless. Oh you crafty girls......I totally need to follow this blog.... You are amazing! That is GORGEOUS! I was thinking of making something like that for my girls but was a little nervous by all the VERY DETAILED tutorials! Yours is super simple, so THANKS! So pretty, love the feminine but not overly done-ness of it :) Thanks for linking up! I love this! thanks for the tut! it would also be a great crib canopy!!!! This is so elegant and beautiful. You truly did a fabulous job! 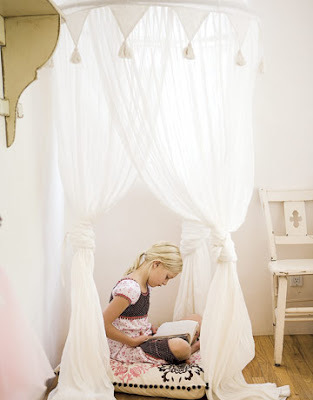 This is like a moodboard for my future daughter...love the canopy. I really love your blog , the bed is fantastic! Great blog post! The little girl canopies are super cute. They make the room look so feminine and whimsical. I am trying to create a custom canopy for my little baby girl's room and it isn't turning out quite as cute as yours. I might start over and use your suggestions. Beautiful! I am in the process of making my little girl her first big girl room. We are planning on painting the walls yellow and doing a canopy over her daybed. I was wondering what color paint and brand you have on the walls? It is exactly what we were looking for. I'm sorry, I wish I could remember! We've lived in 4 houses since then, and I didn't keep the information. I do remember that I bought it at Walmart, but that's about it! I love the floral arrangement! Elegant and beautiful!